Hold on I did not discover a new shrinking laser device but IK Multimedia has come up with the next best thing. The great thing about technology is that when there is a discovery in one area it usually mean there will be aftershocks across many others. 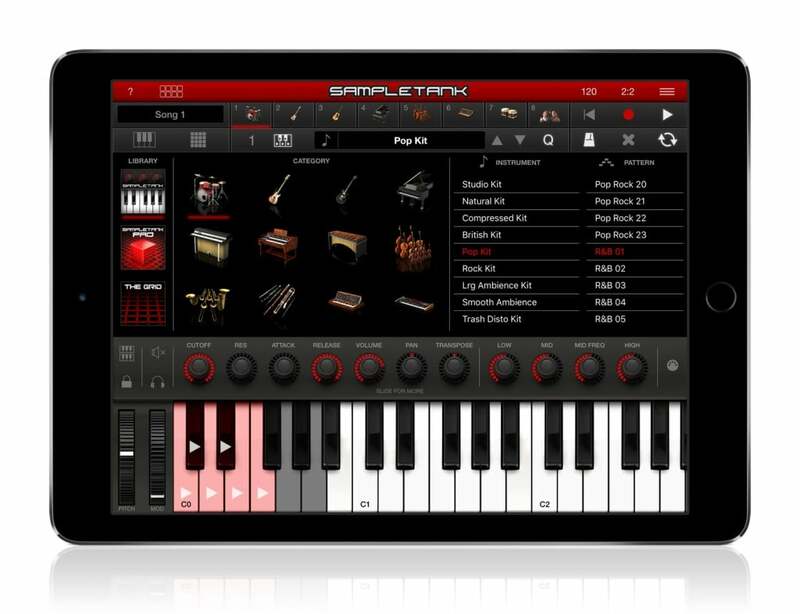 So is the case with the latest app release from IK Multimedia SampleTank 2 for iOS. When IK Multimedia released their long awaited and acclaimed update to SampleTank for the Windows and Mac platforms they created a sort of foundational DNA that could be used in their other products when they rewrote the code from the ground up. By doing this they were able to incorporate the same sound generating engine into their other software products and now their audio apps. This allows for unprecedented consistency for musicians using their products as they can be confident the same level of quality regardless of the platform they are using. It also means that you can count on IK Multimedia to continue to support the SampleTank platform by updating and releasing exciting sound material and under the hood updates to make sure you are getting everything you expect out of your production experience. When you first launch SampleTank 2 you are presented with the main screen. Here is where you will spend most of your time playing and selecting sounds and recording. We’ll start with the top and work our way down. Along the top you have the TOOL TIP selector. When this is clicked you will get handy little help bubbles that will highlight many of the areas presented in the app. This is quite helpful when you are just getting started. The next icon will enable LIVE MODE which is a very convenient way of setting up a streamlined performance enviroment. On the far right you see TEMPO and TIME information. This is used when you are composing and working in SONG MODE. Just below that you will see the current SONG that is loaded into SampleTank 2. Next you will see icons representing the 8 PARTS you can use when working with a song. 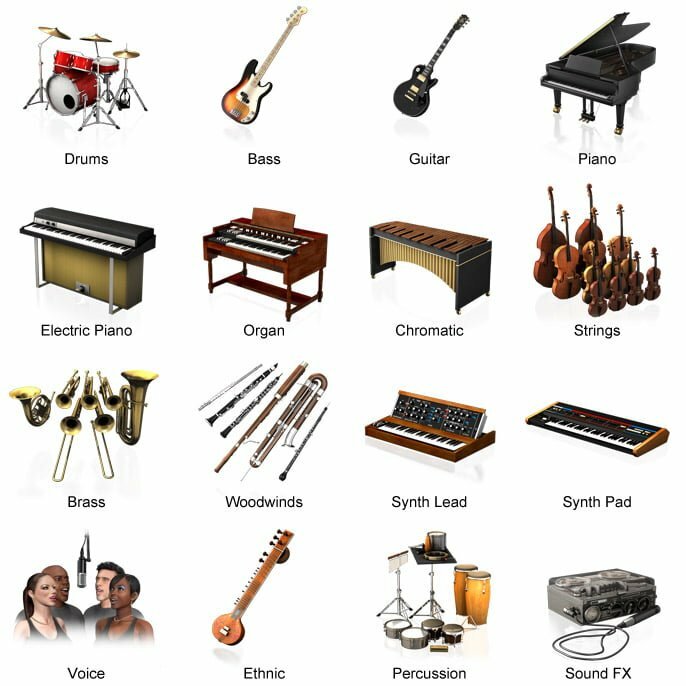 These parts can contain any instrument you have available in your SampleTank library. and finally you have the SONG TRANSPORT CONTROLS. These will enable you to go the the beginning of the song, arm a part for recording and initiate playback. Moving on the main area is occupied with THE BROWSER window. Just above the BROWSER WINDOW you have selectors to switch between KEYBOARD or PAD MODE. This gives you added flexibility for playing the instrument depending on what sound you are playing. Most of the time drums and percussion are more suited for the PAD interface while pianos, organs, etc. are more at home with the more traditional keyboard layout. When we look at the browser window we start to see some of the true power of SampleTank 2 iOS. The majority of musical styles and instrument categories are covered here. You are provided with a generous sound library to start and can build onto it by purchasing additional expansion packs from the built in store. Finishing off the initial tour we have the onscreen keyboard and performance controls. From left to right you have the keyboard mode icon that allows you to go full screen with a stacked keyboard arrangement that allows you to display more keys available to play. You can also use the keyboard in a fixed or scrolling mode. Next you have controls to MUTE and SOLO the currently selected part. Rounding out the controls you have a bank of control knobs that are assigned to specific sound editing parameters. This allows you to have a very quick hands on access to changing the sound on the fly as you are playing. These controls can also be controlled by external MIDI controllers and to that end you are given a MIDI LEARN button to help you in setting up custom MIDI assignments. We can’t forget to mention the pitch and modulation wheels next to the on screen keyboard. All of these controls allow you to access this powerful device in some fun and useful ways and it all takes place on the surface of your device, amazing! All of the convenience and pretty icons would not mean anything if the resulting sound was not equally as impressive. I can say that if you have had any experiences with previous IK Multimedia products you will not be disappointed. SampleTank 2 for iOS comes with a tremendous library of sounds with access to over 1,900 different sounds. They do not take for granted that these will be used on a mobile device. Each sound has been edited with the same care that went into producing the original SampleTank libraries, no compromises here. The advanced computing power in the latest versions of the iPad and iPhone have allowed IK Multimedia to bring the same level of performance and sound quality to these devices. While you are given a generous selection of instruments to get you started it doesn’t stop there. Sampletank 2 takes advantage of the vast resources of IK Multimedia’s sound library and presents you with a wide selection of additional sound libraries you can purchase direct from the device. With these additional sound resources you can customize your SampleTank 2 workstation with the sounds and material that provide you exactly what inspires you to create. These range from additional guitar packs all the way to the Miroslav Philharmonik sound libraries, High Quality pianos, guitars and drums. they have done their homework in making sure you had access to all of the best material. Having all of these powerful sounds is one thing but let’s say you are just relaxing while you are exploring sounds and you get an idea, what to do now; SampleTank 2 has you covered. Under the hood you have a powerful 8 part MIDI recorder. Here you can use a combination of instruments to build out song ideas and basic arrangements. You have control over each part along with its related performance controls and these are all captured as you record. You can also export your songs in order to work with them in your Windows or Mac based DAW applications. Not only do you have some powerful recording and composition tools included with SampleTank 2 you also have a powerful modular sound source that you can use in live performance situations. You have access to up to 8 parts you can assign to instruments or to trigger patterns, loops or phrases. You can also do basic editing on each part with the control strip as well as activate and mute selected parts depending on your needs. You also have control over MIDI channel assignments to add to the overall flexibility. This actually allows you to control SampleTank 2 from various MIDI controllers. For instance you could be playing one of the sounds with a MIDI keyboard while the drums are being triggered by another external MIDI device or computer. You also have access to the MIX VIEW that provides controls for adjusting the blend of the LIVE instruments. You have basic controls for volume and pan. In this view you also have a powerful LAYER VIEW. This view allows you to assign zones or layers throughout the range of your keyboard for your sounds. You can have a bass sound in your left hand that will cover a few octaves in the lower keyboard range and then meet up with a piano sound for instance in the right hand. You can also STACK multiple sounds to cover the full range of the keyboard. This can give you some massive sounds for instance by layering multiple pianos or strings and brass over a piano sound. The possibilities are right at your fingertips. Of course all of your LIVE MODE edits can be save for quick recall in a performance situation. That is what makes things so useful, you have everything ready to go when you need it. The iPad version is an amazing achievement to say the least but let’s take it to another level. Can you believe you have the same level of performance and sound generating capacity in the iPhone version as well? This just blows my mind to think you can have the power of what used to fill entire studio spaces in an app that runs on a phone tucked away in your pocket, in a word amazing! You are only limited to the number of voices (up to 64 in the most current versions) by the processor in your iOS device. Ok so that should get you interested. 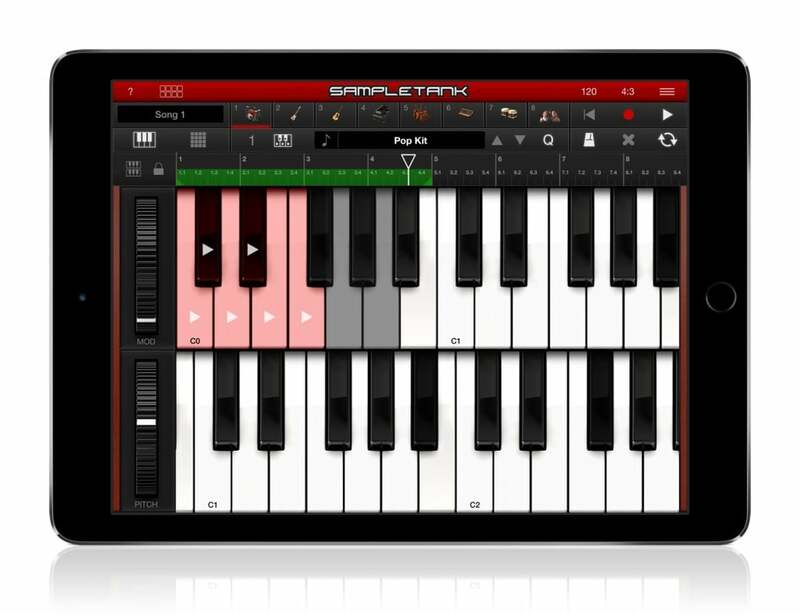 There is so much more to explore with SampleTank 2 for iOS. 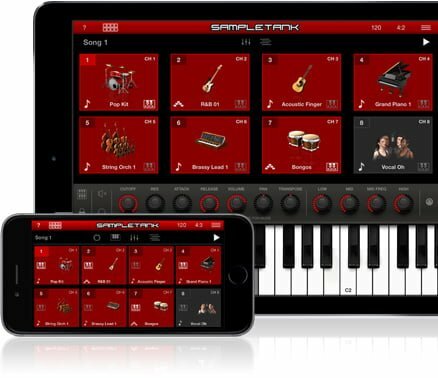 Don’t even get me started with the potentials of inter-app audio and the crazy variety of ways you can connect your iOS device to the many keyboard and pad controllers IK Multimedia produce. I have been enjoying using SampleTank 2 iOS along with the iRig Keys MINI and iRig Pads a very fun combination. So what are you waiting for? 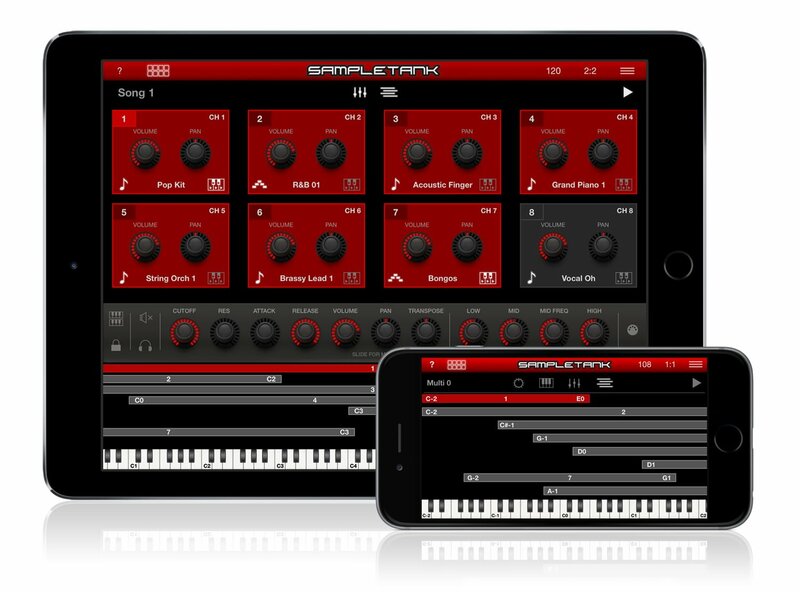 You can download the free version of SampleTank 2 right now by visiting the App Store. The Pro version which includes the initial sound library sells for $19.99. For more information visit IK Multimedia’s website.